Clinton vs. Bush Again, Really? In 1776 Americans declared themselves independent of more than arbitrary rule by a distant monarch. They also severed the ties of aristocracy. This was in itself a revolutionary notion. It meant that political power and its attendant privilege and economic advantages would no longer be transferred by blood. Earldoms, dukedoms, and kingdoms were banished from the territory and from the future of the American people. Almost overnight, the citizen became the self-identifying unit of self rule. Over time, indeed the passing of more than a century, the people of Britain, following their own path, without the total abolition of hereditary privilege, stripped this privilege of its political power. Today the Royal family continues to enjoy great wealth and a certain influence, but zero political power. The queen cannot start a war, raise taxes or, for that matter, even take sides in a political debate. She is the living embodiment of a heritage, a national community, a flag, and a country. In recent years we in America have lived through a disturbing reversal of our concept of the citizen and our foundational rejection of the hereditary model. Despite the fact that we are more than three hundred million strong, when it comes to political power, we seem intent on reestablishing the old aristocracy dismissed and dissolved by our ancestors. When we elect a president we endow this person with immense power. For four to eight years this individual makes extensive political appointments across a wide range of powerful offices. These choices have lingering effects in the judiciary, in law enforcement, national defense, and in bureaucracies too numerous to list here. This constitutes a vast network of patronage, favoritism, and privilege. The Founders understood that power corrupts. In the 1940s a later generation sought to further curb this power by limiting presidents to two terms. They realized, correctly, that no person, however talented, dedicated, or competent, should be permitted to hold such power for more than a limited time. They understood, as hopefully we still understand, that we are human beings, each and every one of us. We are not gods. I mean no disrespect to my fellow citizens who belong to the Kennedy, Bush, or Clinton families. I’m of the opinion that John Kennedy, George H.W. Bush, and Bill Clinton were or are good men who did their best for their country. In the cases of Kennedy and Bush, they are also war heroes. They deserve our admiration. My concern is not with their legacy. My concern and my growing worry is that we are returning, by consensus, to the aristocratic rule from which we liberated ourselves in 1776. 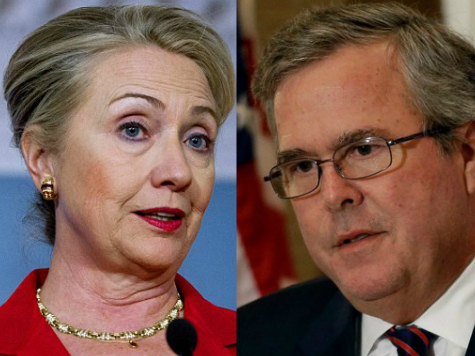 Is there a single day from which we are free of pundits, op-eds, reporters, columnists, politicians, talking heads or cable-TV hosts gushing over the political prospects of a Hillary Clinton or a Jeb Bush? And oh, the gnashing of teeth that went on during the few short months without a Kennedy in the halls of Congress. To this we’ve come. The fusion of celebrity, branding, and political power has returned us willy-nilly to the very political prison we fought to escape in the American war of independence–entrenched, hereditary, aristocratic political power. If Hillary Clinton or Jeb Bush were to become president of the United States it would mean the power and influence of the presidency remained in the hands of the Clinton family for possibly sixteen years, and in the case of the Bush family, possibly twenty. Have we devolved into a nation of sheep, or screaming teenagers during an episode of American Idol? Can it be true that there are no other citizens worthy of the highest office of our land? It is my fervent hope that Ms. Clinton and Mr. Bush would discover in themselves a generous humility that would cause them to realize that enough is enough. Their considerable talents would be better served in other areas. Watching their careers I doubt such self-restraint will be forthcoming. Which leaves it to us, the American people, to reclaim our independence from hereditary aristocracy and to just say no. Ron Maxwell wrote and directed the motion picture Gettysburg.